The Year’s almost over, and you deserve a lavish night out as a reward to yourself for everything you’ve accomplished. 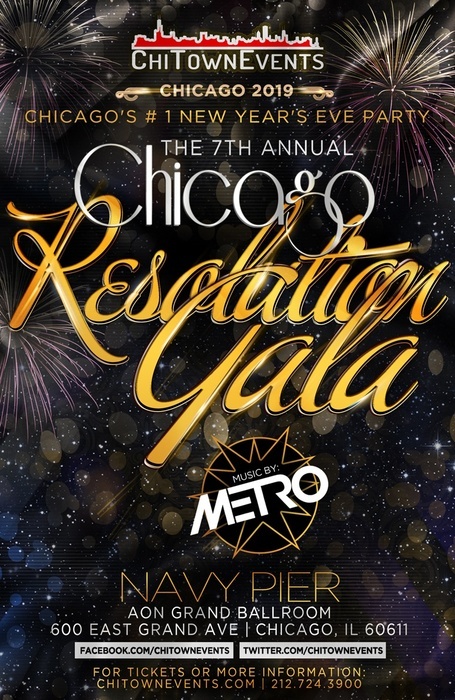 End 2018 with an extravagant party at one of Chicago’s premier venues, the Aon Grand Ballroom. There’ll be drinks, food, dancing, chill vibes, and a gorgeous fireworks display over Lake Michigan. Order tickets to this truly amazing Chicago New Year’s Eve party before it’s too late. Head to Navy Pier and make your way into the Aon Grand Ballroom. Once you step in, you’ll be enthralled by the gorgeous decor of this incredibly spacious architectural marvel. This sprawling venue can fit over 2000 guests, and boasts a panoramic window display that compliments its dome-style ceiling. Another must-experience area where you can catch truly astonishing views of Lake Michigan and the Chicago city skyline is the Lakeview Terrace. All that space will be put to good use as a multitude of Live DJ’s take turns turning tables throughout the night. Get in your groove with the latest and greatest in Pop, Dance, Hip-Hop, Electronic, and Top 40 hits. This is our 7th year hosting the best Chicago New Year’s Eve party, so trust when we say a spectacular night is guaranteed. You shouldn’t end the New Year on an empty stomach. Good thing this Chicago New Year's Eve party is stacked to the brim with buffet areas offering delicious appetizers that are sure to satisfy. Not to mention that there are 30 premium bar stations located in this amazing event gala. When the clock gets closer to midnight, the DJ will call attention to the entire party and commence a traditional New Year’s Eve countdown. After which you’ll enjoy a toast to christen the new year. get ready to be amazed by the annual Navy Pier New Year’s fireworks show. A beautiful array of lights will cascade over the waters of Lake Michigan. That’s what, when, and where of it all. So why haven’t you ordered those tickets yet? We recommend you secure your spot to this Chicago New Year’s Eve party sooner than later, as tickets tend to move pretty fast.